In Municipality of Gorje we find some themed hiking routes suitable for everyone. On these routes we can learn about local particularities and admire our natural and cultural heritage. 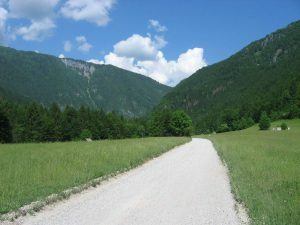 This route is intended for beekeeping enthusiasts and for all hikers and cyclists that are interested in beekeeping or would simply like to enjoy the beautiful views of Gorje villages, wider area of Bled with Radovljica and on the SE part of Karavanke mountain range with their highest top Stol. On the route you can see beehives, cultural and natural attractions of Gorje and monuments of our technical heritage. 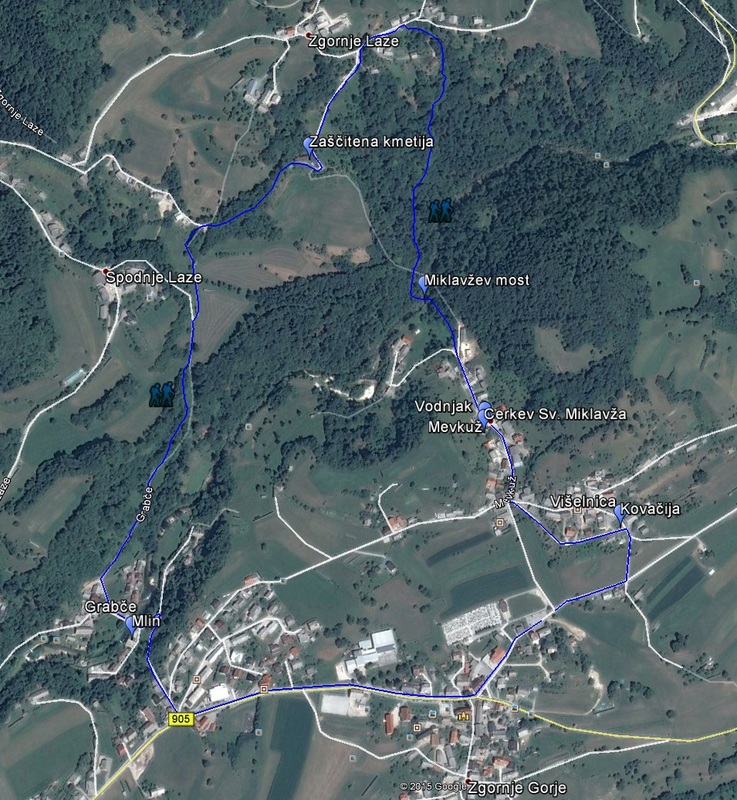 The Beekeeping Route in Muncipality of Gorje leads you through central part of Gorje from beehive to beehive. It leads us through beautiful scenic routes, where you can enjoy the magnificent view of Gorje villages. Towards the east the view opens up to Karavanke and Kamnik Alps, Bled and its surroundings and beyond to Radovljica, throughout the country towards Kranj and further on to the Ljubljana basin. Along this route you learn about cultural, natural and handicraft monuments of Gorje. 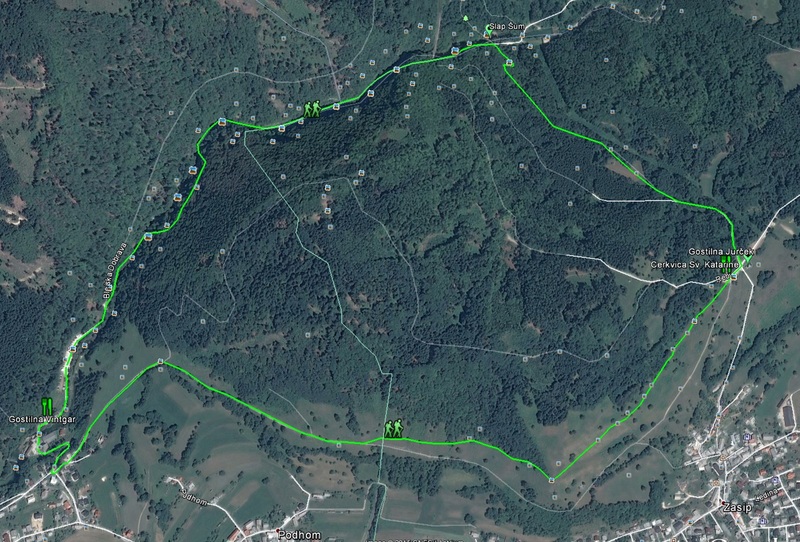 The route starts at Fortuna in Spodnje Gorje. 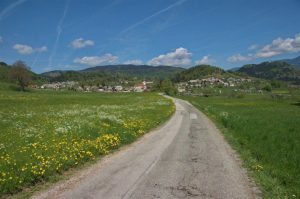 From there you follow peaceful, scenic, gravel road to the village Višelnica. Sheltered location of the Višelnica hill offers unique conditions for beekeeping and that is why you can see many beehives along the way. Beehives stand there for decades. 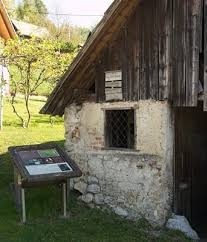 The first beehive on the route is a very picturesque beehive belonging to Jože Bernik from Spodnje Gorje. 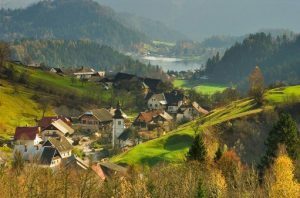 While the path leads you on to Višelnica village why do not stop and take in the beautiful views of “the area of Bled heaven”. Višelnica is a lovely old village and has always been known for the manufacturing of cowbells. This craft was very popular among the villagers in the 18th and 19th century. In that time the bells forged from tin and coated with brass were sold all over Kranjska and Austro-Hungarian Monarchy. Today the only forge that is still in its original form is Jan forge. That forge was working till the end of 20th century. Despite the obvious emphasis on cowbell manufacturing, beekeeping also developed in the village. In the middle of the village below the path is platform of beehives from nearby farm. Under the platform stands big Rožič beehive. In the village you can see some more or less maintained baroque farm houses. Mevkuž is a nearby village merged with Višelnica. The village is known after the water spring that the locals named St. Nicholas’s water. The water is said to hold healing power. Today we can see this water in the trough in the middle of the village by the Church. Trough replaced the old tap that the locals used to get the water. 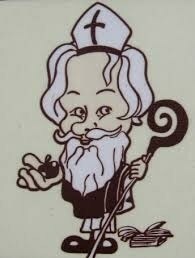 In order to reach Mevkuž village you need to turn right at the chapel of Saint Nicholas and Saint Florian. The filial church of Saint Nicholas is worth visiting. The baroque Church with gothic presbytery and marvellous frescoes was built in 1430. Nearby on the right you can see non-populated beehive. When you come back to the chapel of St. Nicholas and St. Florian the route takes you right on to the sunny path where you can admire under you the village of Zgornje Gorje with its parish church of Saint George. At the last house on the right you can see Hostar beehive. After crossing the plain field you arrive to the second house on the left where in the garden stands the beautiful Maček beehive. The route continues along the street of the upper part of Gorje to the junction where our scenic route leads right down in to the valley formed by river Radovna and where on both sides of the river connected by a bridge we find Grabce – a picturesque village with a rich craft heritage. 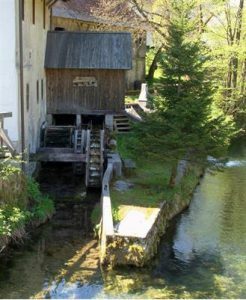 In the past the village had two mills, sawmills, forge and tannery. The village also had a manufacturer of wooden buckets. Today the Castle Mill and almost 400 years old tower of Miha forge are well preserved and beautifully restored. At the site of the former sawmills and forge today operate three small electrical power stations. When crossing the bridge you can see a wonderful tower sign of Saint Florian and Saint John which stands on a rock in the middle of the river. From Grabče the route leads you left on the sunny bank of the river up to the village Krnica. At the end of the village Grabče you can see the upper dam. Part of the water from this dam flows underground to the famous Lake Bled. On Strdeno Brdo where the path joins the road to Laze and Mežakla a view opens up on village Krnica. The route continues downhill across the bridge into village. The second house on the right is a rare example of well-preserved half-timbered Alpine baroque house with a little statue of St. Nicholas on the façade. In the village on the left is an updated Cop sawmill and a former mill. The route leads you along the road past the pub Pri Konavcu. At the top of the hill is a right turn for the famous Pokljuka gorge. Further left under the road stands typical Slovene beehive with 56 beehive panels. The panels were painted by the pupils of Elementary School from Gorje. On the junction before the bus station in Krnica you go right across the road through fields to the first junction where a wonderful view of Gorje district with Stol and Begunjscica mountains in the background opens before you. 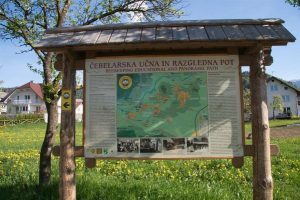 Here you can descend to the left along the shortest route towards Gorje where under the path you can see a small beehive or continue straight ahead towards the village Poljšica. Along the way you can visit the natural attraction – Poglejska cerkev (Poglejska Church) from which you have a wonderful view of Gorje and its surrounding area. At the junction under Poglejska cerkev (Poglejska Church) turn left towards Zgornje Gorje. In the village turn right towards the old village centre where you find the chapel with the former altar statue of Saint George. On the left you can see two baroque farmhouses. The road leads on up the hill to the parish church of St. George. Its presbytery is a remain of the older Gothic church with partially preserved frescoes from the year 1460. In 1894 the church was renovated and a year later master Matija Kozelj from Kamnik decorated the church with newer frescoes. Altar paintings are the work of Leopold Layer, paintings on the choir loft are the work of Štefan Šubic. Before the church next to the cemetery stands the monument to the fallen soldiers of the World War II. The monument is the work of Plečnik’s school. At the bus stop at the church turn left past the monument to the fallen soldiers of the World War I. To return to the starting point continue for about the kilometre past the village square, municipal building, post office and fire station. Public transport Bled – Zgornje Gorje. Parking at the cemetery in Zgornje Gorje. The route is poorly marked past Komar mill by the river Radovna. The route runs behind the house to the footbridge over the river Radovna. The forest path in the valley of the river Radovna is rather steep and on individual sections the path is interwined with roots. Bench and a viewing point along the way. The route got its name after the patron of the church of Saint Nicholas from 1428 in Mevkuž. On the information board by the parking at the cemetery in Zgornje Gorje you find the presentation of Saint Nicolas route. 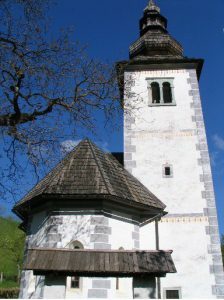 From there the route leads you along the road past Pogvajn forge in the village Višelnica to village Mevkuž where stands the church of Saint Nicolas. Next to the church stands a village trough where “Saint Nicolas’s” water flows. The valley of the river Radovna can be reached in two ways. The forest path on the right is rather steep, the second and the easiest one goes through the village past Komar mill to the footbridge over the river Radovna. Forest path which rises steeply towards the village of Zgornje Laze and the slope continues past Rekar homestead to a lookout point from where a nice view opens through village Mevkuž to Lake Bled. Furthermore, the path along the forest slowly descends towards the village Grabče where you cross the bridge over the river Radovna. At this point Saint Nicolas route ends. You come back to the starting point up the road through the village of Zgornje Gorje. The route takes you from the parking before the gorge through the Vintgar gorge and then further on to the church of Saint Catherine (a historic church and beautiful views) on Hom. From there the route takes you through the southeren slope of Hom back to the starting point. The route through the gorge takes you over the bridges and so called Žumer galleries and ends with the bridge over the mighty 16 m high river waterfall Šum. 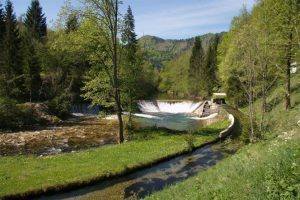 Due to its natural beauty the Vintgar gorge is considered as one of the must-see tourist attractions in Slovenia and because of that the number of visitors is increasing every year. 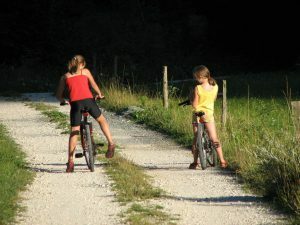 The cycling route Radovna is suitable for both families and persistent cyclist. You start at a information board at the bus stop in Zgornje Gorje or you can leave your car in Krnica. 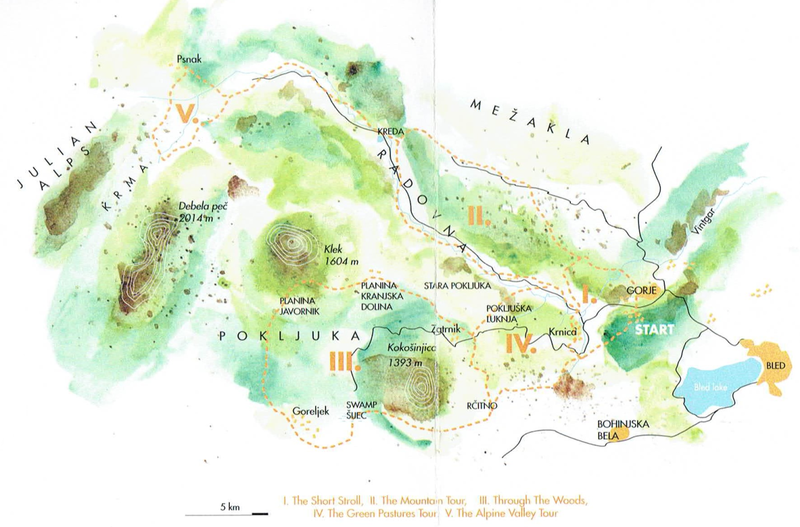 You can cycle to Pocar Farm (Pocarjeva domačija ) in Zgornja Radovna or to the mountain lodge in Krma. 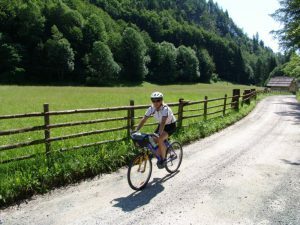 More experienced cyclist can continue to Mojstrana where they can join » Jure Robič« cycling route and back to the starting point throught Jesenice. 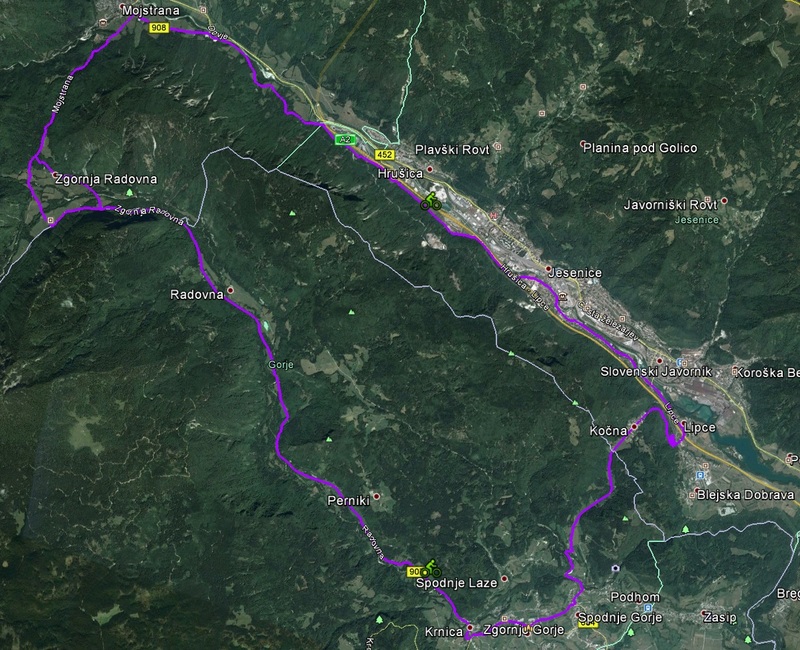 The second possibility leads from Mojstrana to Kranjska Gora and continues to Fusine Lakes in Italy. 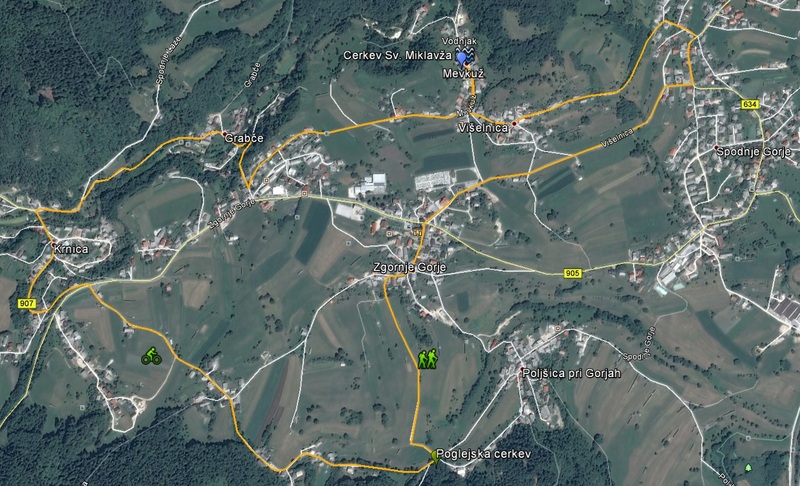 You can also go futher following »Alpe Adria« route to Grado, a town in Italy. Shorter but also popular is a route over Laze. On Zgornje Laze you can enjoy beautiful views of Bled and its souraundings. The path is suitable for more experienced cyclist ,the longer version is only suitable for mountain bikes. 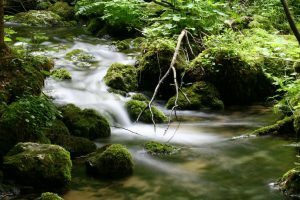 Municipality of Gorje offers lots of possibilities for more or less demanding hiking tours. Gorje with the Radovna and the Krma valley serve as the starting point for ascents up to the Julian Alps and Mt. Triglav. Pokljuka is attractive and interesting in every season of the year. From there you can hike along the mountain pastures (Uskovnica, Konjščica, Zajamniki, etc.) or ascent the highest peaks of the Julian Alps. Another well-visited location is the “Blejska koča na Lipanci” mountain hut. If you are a persistent hiker, you can continue your hiking all the way up to Debela peč, Lipanski vrh, Mrežice, etc. Debela peč is a 2014 metres high mountain, which rises steeply above the Krma valley on one side, and gradually descends towards the extensive Pokljuka forests on the other. 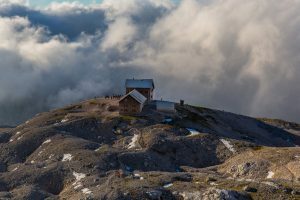 From the top, where there is a stamp and a logbook, you can enjoy a glorious view of the highest peaks of the Julian Alps, the Karawanks, and – if the weather is nice – the Kamnik-Savinja Alps. The “Blejska koča” mountain hut is located on the viewing pasture Lipanca. From the hut which is open all year round, you can enjoy a beautiful view of the Pokljuka forests and summits (Mrežce and Lipanski vrh), which surround the pasture. 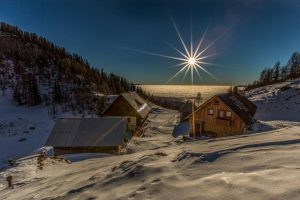 The mountain hut Vodnikov dom is located on a small terrace at the foot of the west slope of Tosc close above Velo polje. 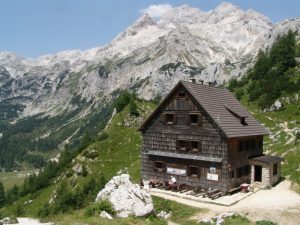 From the hut there is a beautiful view on the Triglav and the surrounding peaks. Velo polje is one of the biggest and highest located (1675 m) mountain pastures in our mountains. 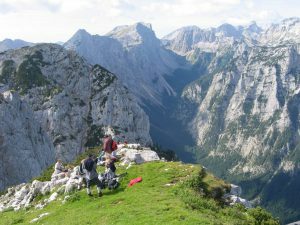 Due to the unique position in the heart of the Triglav-Mountain-group it is truly one of the most beautiful high mountain pastures. 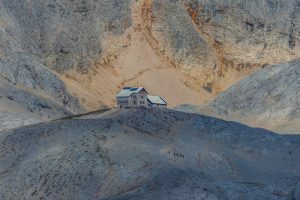 Mountain hut »Blejska koča« is located at the edge of Lipanca mountain pasture. It is open all year round and you can enjoy the views over Pokljuka forests and all the nearby summits such as Mrežce or Lipanski vrh. 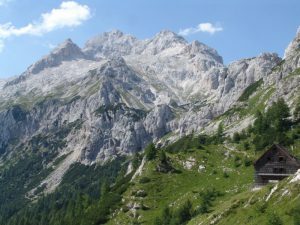 The mountain hut Planika is located on the south side below Triglav. The hut is open in the summer season. 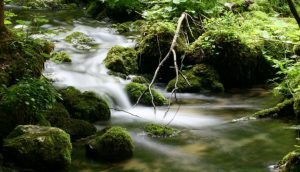 You can enjoy beautiful views of the Triglav and mountains above the valleys Krma and Bohinj. Debela peč is a 2014 m high mountain, easily accessible from wast Pokljuka forests and high above the Valley of Krma. There is a record book and a stamp on the peak and you will enjoy the beautiful view to the highest mountains of Julian Alps as well as Kamniško Savinjske Alps. A picturesque landscape and beautiful skiing trails call for a nice and inspiring winter recreation. 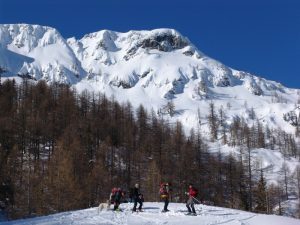 The flat and slightly hilly terrain is absolutely ideal for this type of recreational activity; therefore, in pleasant snowy conditions the skiing trails are nicely arranged and can connect places across the extensive pastures. The best and complete conditions for cross-country skiing are on the Pokljuka ravine. The tracks there run through quiet forests and across extensive mountainous pastures. 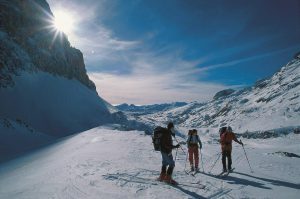 From the end of November till April, it offers ideal conditions for cross-country skiing. 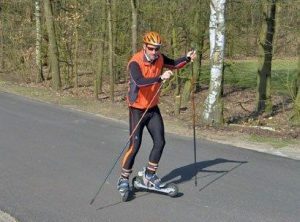 Skiers can experience more than 30 kilometres of nicely arranged trails for classic and skating technique. 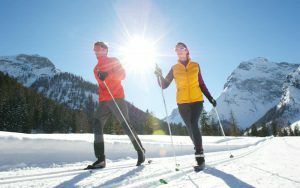 In case you have never gone cross-country skiing before, but have always wanted to try, there are also instructors welcoming you. In only a few hours they will teach you the proper techniques of cross-country skiing. INTERESTING FACT: During winter, there are biathlon competitions organized, including the BMW BIU World Cup. Pokljuka is also the official training home ground of the Slovenian biathlon team. Among ski mountaineering enthusiasts Pokljuka high plateau is famous for its ideal conditions. 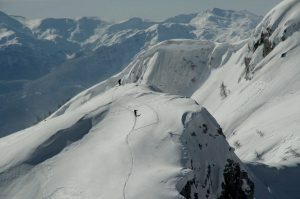 It’s usually the best at the end of February, when many sport fans explore the near-by plateaus and peaks, thus seeking challenges on the pristine snow. Ski slopes on Pokljuka are more suitable for less demanding skiers and children. 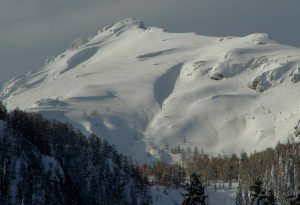 Althrough Bled is not a classic alpine skiing sports centre, those who like snow, the sworn alpine skiers and snow boarders as well, are well provided for. 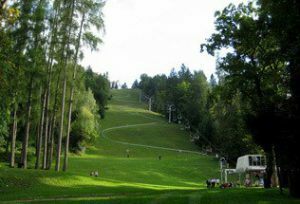 The ski slope at Straža is almost ideal, be it for visitors or for local skiers. Only a short walk away from the centre of Bled, it is equipped with a double chair-lift and a rope tow and has artificial snow making equipment as well as lighting for night skiing. The bottom post of the chair-lift is at an altitude of 503 m and the top post at 634 m – the entire skiing surface is 6 hectares (tel. +386 4 / 578 05 34, +386 4 / 578 05 30). 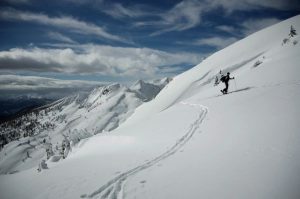 A ski school is organised and ski rentals are available on site and also in some tourist agencies. 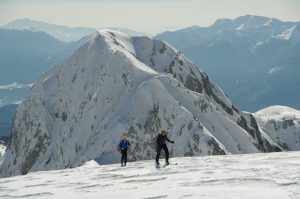 More demanding Alpine skiers can try different ski slopes in the vicinity of Bled. Vogel, Krvavec and Kranjska Gora are joined in the Ski pass Slovenian Alps which allows the holders of such ticket free ski bus transport from Bled to Vogel and Krvavec. 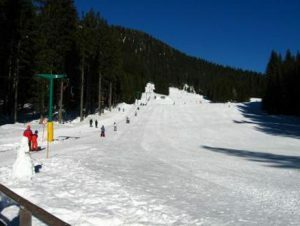 There are also ski slopes on Viševnik and Soriška planina. 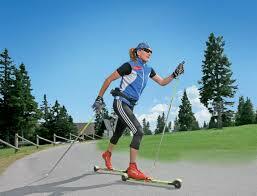 This is winter sport, which is more than suitable for all ages and among the more popular winter sports. 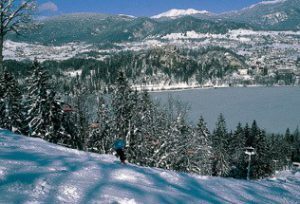 Sleddging in Bled and its surroundings is possible at specific parts of ski slopes and on special toboggan tracks. Summer sledding on the Straža ski slope is routed along the FIS route, down the double chair lift line. 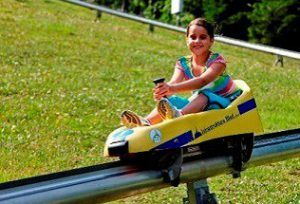 The sledding route is arranged over a very interesting terrain and offers splendid view of Bled, Bled Castle, Lake Bled and the countryside of Bled. The selected route ensures an interesting ride and takes care for an appropriate measure of adrenaline. A walk in the highlands is possible even in winter, if we are properly equipped. Snowshoeing can be a lot of fun! Exploring ambient snowshoe trek through the snowy Pokljuka offers enjoyment and relaxation. The use of snowshoes is easy when the trekking poles are used. Suitable footwear, mountain or other winter boots. Fishing season: 1.3. do 30.11. Fishing district: Radovna river from the bridge at the memorial in Srednja Radovna (middle Radovna) to Vintgar gorge with possibilities “catch and release” or “catch and keep”. Fly fishing – catching with fly rod and one artificial fly and a single barbless hook. 3 Salmonids of which only one brown trout. You are allowed to keep only one Salmonidae over 50 cm (20 in). – brown trout 30 cm (12 in), from 1. 3. till 30. 9. – rainbow trout without limits, from 1. 3. till 30. 11. 1-Day License, 7-Day License for all “catch and release” districts, Annual License. In the field of Pokljuka display and organize guided tours of Nordic walking. 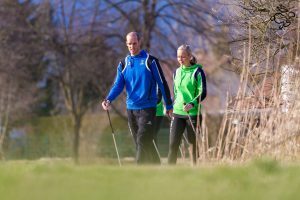 Participants learn about the benefits of Nordic walking in the health and sports point of view, and given the appropriate equipment with which a professional guide on a journey. The new biathlon center Pokljuka offers excellent opportunities for skateboarding, both for recreational and professional athletes. 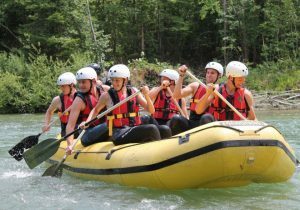 Rafting Bled is an adventure that combines pure adventure and glorious nature. It is believed to be a journey full of new discoveries that you can share with your friends or family. 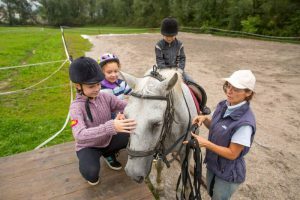 During the 2h ride on the Sava River the experienced guides will provide safe and fun-filled journey. Canyoning is an unforgettable 2h experience. It is a story of discovering magical natural spots while following a crystal clear water trail. If you are curious, you will love the magic of water and unspoilt nature, you will discover a new world which is usually inaccessible. Swimming, jumping, sliding on natural toboggans, games and fun are what make up this new adventure. It is very difficult to describe the emotions you will experience, you need to try it in order to understand it. No previous experience is needed. Experience the thrill of a lifetime! 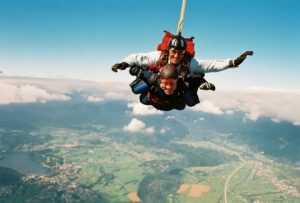 The Tandem skydive is by far the most popular way to make the first skydive. With minimal ground training you are able to experience the exhilaration of a freefall for nearly one minute before the parachute opens. After approximately 20 minutes of ground instruction, you and your tandem jumpmaster will ascend in the aircraft to an altitude of at least 3000 m. Before you exit, you will be attached to a professional tandem pilot via a special harness system. Safely connected and ready for freefall, you both exit the airplane and freefall together until you have descended to an altitude when the parachute is pulled open. The canopy (parachute) ride lasts 4-5 minutes. 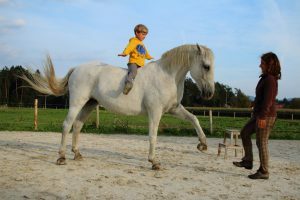 On our farm we breed the Slovenian indigenous horse breed – the Lipizzan horse. Our farm is located 5 km far from Bled. For reservations ask at your host or contact us directly. 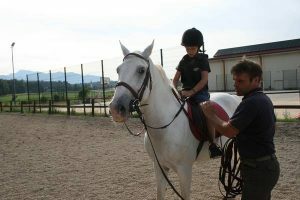 We will arange transfer from Bled to farm and back. We accept max. 4 riders at once.